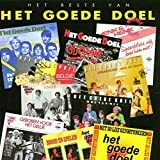 Het Goede Doel (English: The Good Cause) is a Dutch pop-group fronted by Henk Westbroek and Henk Temming as constant members. The original line-up, formed in 1979, was completed by Sander van Herk (guitar), Roland Jongeneel, Stephan Wienjus (bass) and Ab Tamboer (drums). Others joining in later included Arnold van Dongen (guitar), Lené te Voorhuis (bass) and Danny Sahupala (drums). In 1982 they had their breakthrough hit with "België (Is er leven op Pluto? )"; inspired by the international success of VOF de Kunst's Suzanne they released an English version (Luxembourg) in 1985, naming themselves either HGD of The Good Cause. Afterwards the group was reduced to a nucleus of Westbroek, Temming and Van Herk; they broke up in 1991 and focused on solo-projects. In 2001 the band payed a reunion-show in the classic line-up to celebrate their 10th break-up anniversary. Westbroek and Temming continued and released three more albums.